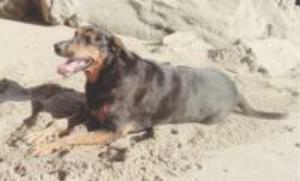 Jellibean (Jelli) was a red Doberman Rottweiler mix breed large dog, 115 pounds. 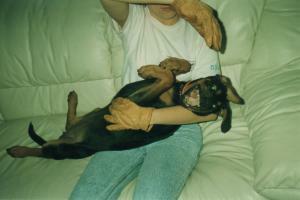 I affectionately called her my “Rotten-Dobbie” — spoiled rotten dobbie! Her favorite meal was king crab legs with chardonnay. She would put her chin on my knee and drool. I always kept a napkin on my knee for her. 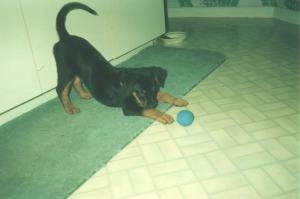 She also liked squeaky toys and slobbery tennis balls! She always smiled a lot when we played our "footie game." Jelli came into my life when she was only 8oz and 48 hours old. 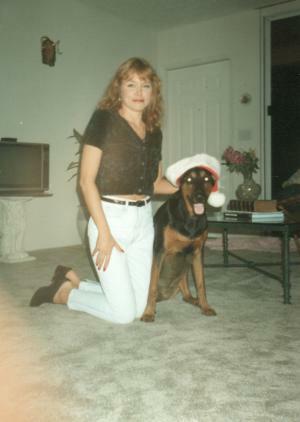 I was working at the North County Humane Society in Jupiter, Florida, a no-kill rescue organization. One night a man and his son came in with a very sick red Doberman, who had recently given birth to a litter of Rottweiler crossed puppies. She was so sick that we needed to hospitalize her and unfortunately during this time she was too sick to nurse her pups. The man said that he was “just gonna go out back and shoot them.” His son's eyes welled up and they left. Several hours later the boy his returned with the pups for us to take. Then the boy walked out a man that day. 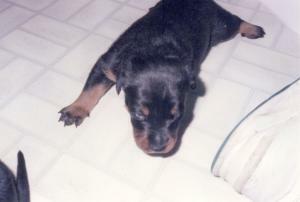 As the puppies were only 48 hours old, they would require around the clock care. The director asked who would be willing to take one home? I hollered I would take one and then being a smart girl, I said give me two. I went home and put them in a box beside my bed with a heating pad in it. I had to get up every few hours to bottle feed them. At that age, they cannot even pee. Normally, the mother dog would lick them to help them. I would hold them over the sink and rub them with a warm wet paper towel to get them to void. The next day everyone was exhausted and really did not want to take them for another sleepless night, let alone for the next two months! I had fared better because I had taken two and they had each other for company. After that first night I took the rest of the litter except for one that a co-worker was still willing to care for as she wanted to raise it for her very own. So that left me with five. A few days later her pup died and it was autopsied. They determined that it had aspirated on the milk. As she still wanted one, I had to give her another one, so I now had four to raise. I would bring them to work every day and we would let them nurse briefly from the mother while she was recuperating from her surgery. As she had stitches and IV fluids running, we couldn't let the pups scratch her incision or dislodge the IV. Eventually she was well enough to go home. Everyday when I brought the pups to work with me I kept them in a big box behind the front counter. They were all males except for one female. Often people would come in to see them. They were all spoken for. I kept the girl, whom I named Jellibean. Now to everyone who says that they have the smartest dog, I really must set the record straight once and for all: Jelli was the smartest dog! 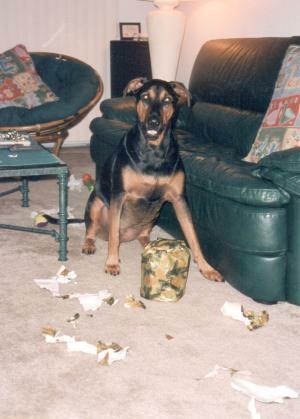 She was very smart; the smartest dog that ever lived! She learned so many words that it was impossible to talk about things in front of her, as good words were met with much enthusiasm. Words like swim, beach, ride, pool, piggy, and pizza. Jelli liked pizza very much. One day I found a piece of pizza in my bed that she had buried for later. She would even recognize pizza commercials on TV. She would bounce up and down and whine when one came on. I had to spell things so that she would not know what I was saying. Then she learned how to spell! She also could tell time. Jelli knew when it was piggy time, as she always got a pig ear before bed time at 11pm. 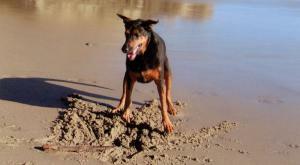 Jelli loved fetching tennis balls, sticks, chasing squirrels and ducks, digging in the sand, and most of all swimming. I used to sing the theme from “Jaws” and chase her around the house & wrestle her if I caught her. She also appreciated my cooking unlike the men in my life! When she was just a little pup, I wadded out into the Intercoastal up to my waist and put her into the water. She immediately made a beeline straight for the shore. She ran up to two girls sunbathing and stole a squiggly from one of the girls' hair. Jelli would swim in the ocean no matter how rough the water. She would go out when the surfers were out and even when it was too rough for them! She could time the waves to get out past the break water. Jelli enjoyed car rides too. My friend Pam would ofter stop by and take her to Baskins Robbins for ice cream. One day a stranger was cleaning out their car and had the doors opened. Well, Jelli jumped right in the back seat ready to go! Sometimes she did funny things. One time when we were aquarium store some man was bent over looking at the fish & she stuck her nose where it didn't belong. It was hard not too laugh as it wasn't expected at the aquarium store. I hurried her down the aisle before I started laughing. Jelli was so well behaved that I didn't have much use for a leash. Often I would forget to bring it when we went to the vet. Not that she needed it, it was more to make others more comfortable. She went everywhere with me. One day she chased a stray cat at full speed. She stopped on a dime at the curb when the cat ran across the street. She knew not to set foot in the street! We took long road trips from Florida to Virginia many times. We even went from Florida to California. It was great having a dog that I could take anywhere without a leash. I swore that I never would have another dog that I couldn't walk off leash, but that was before I got my Jack Russell, Spot...but that's a whole other story! Sadly, Jelli succumbed to bone cancer at the age of twelve. Her front leg had to be amputated and she underwent chemotherapy as well. I tried everything I could. When she couldn't walk I carried her. I used a sling or sometimes made a magic carpet ride, where I slipped a rug under her and drug it outside so she could sunbath. Jelli was my best friend. I used to tell her all my secrets, which she kept very well! When I didn't feel good I used to snuggle up with her and it always made me feel better! Funny, when a man snores its just annoying, but when she snored it was funny. 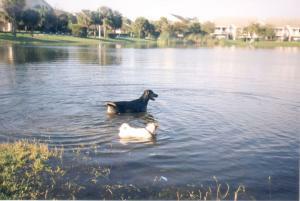 She used to swim in the irrigation pond with ice around the edges with my father's lab Barney in the winter. Then we would race back home before we froze! She was my Best Friend! I was with Jelli when she passed. She had spent the day sunbathing in the yard, but that night she had a chill. I was going to put a blanket in the dryer to warm her up, but then she made a funny sound and was gone minutes later. The next day we had a funeral and placed her in the front yard. It was a cold and windy Sunday, January 6th, 2007. My neighbor saw us. I wrapped her in a pink chenille rug. I put some beach sand and some of her favorite toys into the grave with her. Someone placed a rose by her head. For most people the story ends here, but if you have an open mind, you may continue reading her story. It was hard to be home, as the house felt so empty and cold. I felt that I was constantly tripping over Jelli, in all the places where she liked to lay. A few days later the neighbor came over with goose bumps on his arms and told us that he had seen her the night before making her rounds around the front yard before bedtime, like she had always done for many years. He swore it was her and said that it was my three legged dog! He said she then cut across the yard and disappeared threw the front door. He said he knew this was impossible as he saw us at the funeral. Sometimes my Jack Russell would stand very still and just stare and stare. I began to think that perhaps he was having a mild catatonic seizure. Now I know that he was seeing or sensing Jelli as I saw her three times myself. The first time I saw her, I was home alone and I had gone towards the back of the house by the bedrooms to get something. I immediately became fear stricken that was not alone in the house. I ran to turn the light on and went into the master bedroom and then I saw her curled up in her new bed that I had given her for Christmas. The next time I saw her it was piggy time, 11 pm. I went to give the other dogs their pig ears and she ran past me and disappeared out threw the patio door. 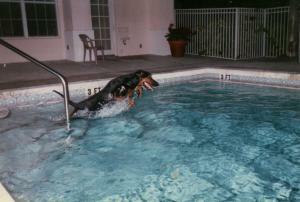 Another time I saw her looking at me with her tail and ears perked up asking to go into the pool for a swim. I am not a lunatic, but I love dogs and I loved her! Jellibean was the best dog ever and she will always be this girl's best friend! They say that people grieve more for their pets than for humans. I can understand that. Jelli wasn't human; she was better than human. 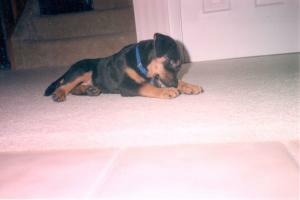 Jelli really was the best dog ever and my best friend. Jellibean, thank you for twelve years of love and joy.